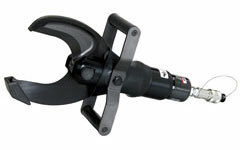 P-105YC Hydraulic Cutters: Izumi Products. The P-105YC scissors type cutter head was designed to cut various cables used in the industry today. It can cut up to 105mm OD cable (not steel core) The scissors type cutter head provides exceptional ease of use and maneuverability when making cuts. It can cut the cables with a minimum amount of distortion. Handle stand support helps operation with hands and on ground. Durable Handle Stand Support. Cutting of hard steel wire prohibited Cutting capacity reference for Material and size. 600V-CV325mm�	4 core (�72). 600V-CV600mm�	single core (�41). 600V-CVT400mm�	Triple cable (�72). 6600V-CV600mm�	Single core (�47). 6600V-CV325mm�	3 core (�77). 600V-IV500mm�	Single core (�35). 600V-VVR250mm�	4 core (�65). sold separately: Hydraulic power pack and 10 000 psi hydraulic hoses.